Jerry Seinfeld will go down in history as the man who wrote and starred in a hit television show about nothing. 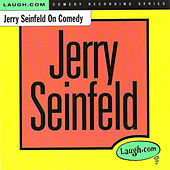 After impressive appearances on Johhny Carson's The Tonight Show and Late Night With David Letterman, Seinfeld starred in his first HBO special, Jerry Seinfeld's Stand-Up Confidential. Three years and plenty of momentum later, NBC approached Seinfeld to star in his own television series, which was a hit with the critics but initially got a lukewarm reception from the public. Eventually, of course, the show became one of the brightest jewels in NBC's crown and made stars out of its excellent supporting cast.